During his successful painting career, which spanned four decades of modernism, Charles Green Shaw skillfully explored several abstract idioms. A native New Yorker, Shaw’s early work was in writing; in the 1920s he contributed to publications including the New Yorker and Vanity Fair. During travels to Europe from 1929 to 1932, he gained first-hand experience with new developments in modern art, and began to devote himself to painting. By 1940, Shaw had developed the idea of the “plastic polygon,” a pictorial structure based on simplified architectonic and organic shapes combined with a Cubist grid. Shaw worked with variants of this concept in painting and in wood relief constructions. 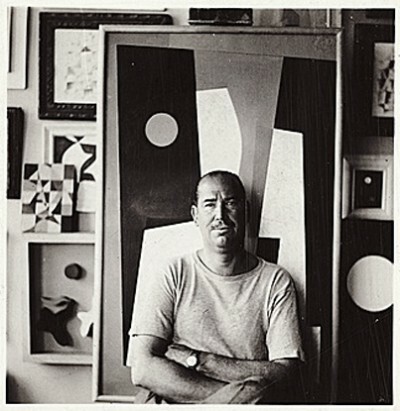 With the exception of a few depictions of simplified, angular figures in the late 1940s, Shaw’s work remained essentially nonrepresentational for the rest of his career.